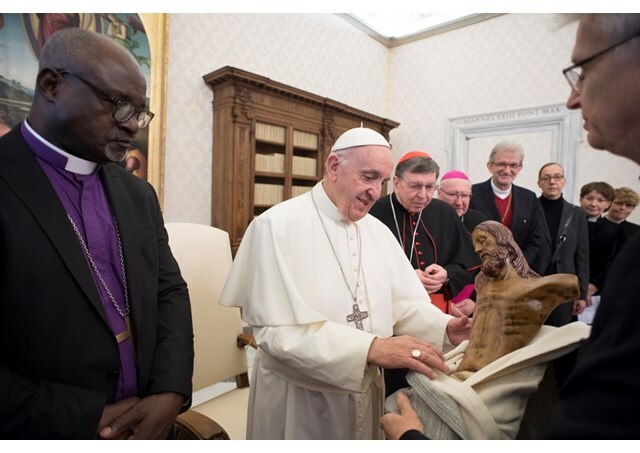 Pope Francis in audience with the members of the Presidency of the World Lutheran Foundation. I extend a warm greeting to you, to Dr. Junge, the General Secretary, to the Vice Presidents and to the Delegates of the Lutheran World Federation. In expressing gratitude for your kind words, I offer my congratulations on your recent appointment as President. Today we can join in commemorating, as Scripture teaches, all that the Lord has accomplished in our midst (cf. Ps 77:12-13). We think in particular of the ecumenically significant moments of the recently-concluded Year that marked the fifth centenary of the Reformation. I am especially happy to recall 31 October 2016, when we prayed at Lund, where the Lutheran World Federation was founded. It was important for us to meet first and foremost in prayer, for the gift of unity among believers takes root and blossoms not as a result of human projects but by the grace of God. Only by praying can we care for one another. Prayer purifies and strengthens us; it illumines our path and enables us to move forward. Prayer is like the fuel of our journey towards full unity. Indeed, the love of the Lord, which we experience in prayer, sets in motion the charity that draws us closer; it is the source of our patient expectation, the motive of our efforts at reconciliation, and the power that enables us to go forward together. Prayer is in fact “the soul of ecumenical renewal and the yearning for unity”, the “basis and support” of all dialogue (cf. Ut Unum Sint, 28). By praying, we can constantly see one another in the right perspective, that of God our Father, Whose loving gaze rests on each of us, without preferences or distinctions. In the Spirit of Jesus, in whom we pray, we realize that we are brothers and sisters. This must be our continual starting point. From it, we can also look to the past and thank God that the painful divisions that kept us distant and in conflict for centuries, have brought us in recent decades to a journey of communion, the path of ecumenism awakened by the Holy Spirit. This has led us to abandon old biases like those having to do with Martin Luther and the state of the Catholic Church in that period. A significant contribution has been made in this regard by the dialogue between the Lutheran World Federation and the Pontifical Council for the Promotion of Christian Unity, initiated in 1967. Today, at a distance of fifty years, we can recall that dialogue with gratitude, and acknowledge certain particularly important texts, such as the Joint Declaration on the Doctrine of Justification and, most recently, From Conflict to Communion. With a purified memory, we can now look with confidence to a future unburdened by past conflicts and preconceptions, a future whose only debt is that of mutual love (cf. Rom 13:8), a future which calls us to discern the gifts coming from the different confessional traditions and to receive them as a common patrimony. Prior to all disagreements, differences and past hurts, there is the present, foundational and permanent reality of our baptism, which has made us children of God and brothers and sisters of one another. Henceforth we will never again allow ourselves to be adversaries or rivals. Although the past cannot be changed, the future challenges us: we can no longer refuse to seek and foster greater communion in charity and faith. We are also called to be on the watch against the temptation of halting along the way. In the spiritual life, as in ecclesial life, whenever we halt, we are always turning back. To be self-content, to pause out of fear, indolence, weariness or convenience in the midst of our journey to the Lord in the company of our brothers and sisters, is to refuse His invitation. In order to advance together towards him, fine ideas are not enough; there is a need for concrete steps and outstretched hands. That means, above all, spending ourselves in charity, looking to the poor and the least of the Lord’s brethren (cf. Mt 25:40): they represent precious signposts to us along our way. It will do us good to touch their wounds with the healing power of Jesus’ presence and with the balm of our service. By this simple, exemplary and radical way of acting, we are called, today, in particular, to proclaim the Gospel, the priority of our Christian life in the world. Reconciled unity between Christians is an indispensable part of that proclamation: “How indeed can we proclaim the Gospel of reconciliation without at the same time being committed to working for reconciliation between Christians?” (Ut Unum Sint, 98). Along the way, we are spurred on by the example of all those who have suffered for the name of Jesus and are already fully reconciled in his Paschal victory. How many there are, even in our own day, who are suffering for their witness to Jesus! Their heroism, shown in meekness and peace, urgently summons us to an ever more authentic fraternity. Dear Brother, I cordially invoke upon you every blessing of the Lord. I ask the Holy Spirit, Who unites what is divided, to pour out upon us His gifts of wisdom, meekness, and courage. And I ask each one of you here present, please, to pray for me. Thank you.